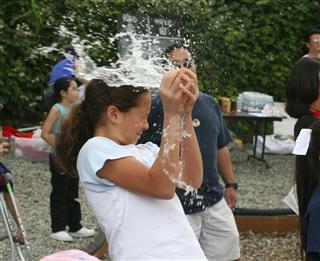 Water balloon games are great to beat the boredom, and enjoy during picnics or parties. Scroll down for some of these entertaining games for adults. 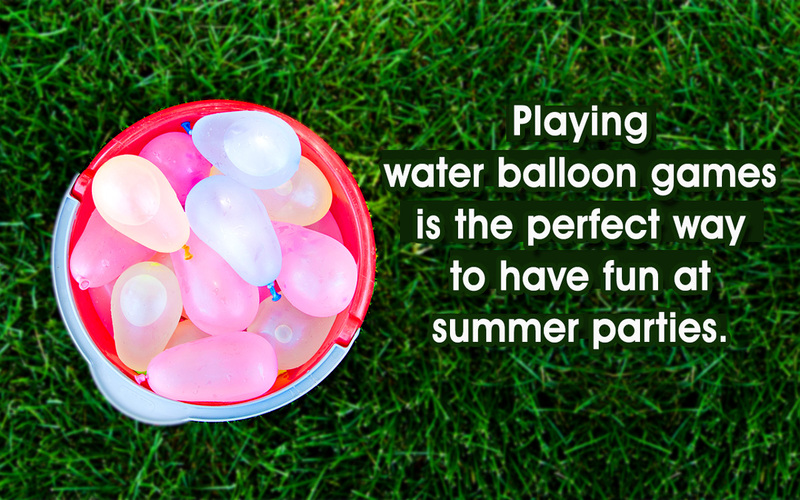 Water balloon games are the perfect way to have fun in a group, especially during summers. Who says they are meant only for kids? Adults too can engage in them, and rediscover the hidden child within. Given below are some fun water balloon games, which can be played at parties, picnics, or even office outings. Divide the group into two teams, and have them stand in a row. The participants in each team should stand about one foot away from each other. Keep one empty bucket at one end of the row, and one bucket full of water balloons at the other end. As soon as the whistle goes, the first one in the row has to pick up a balloon from the bucket, and throw it towards the team member standing next to him, who, on his part, has to catch and throw it to the next person in the row. Likewise, the balloons are caught and thrown by team members, and finally put into the empty bucket at the end of the row. The team, which is able to fill the empty bucket with maximum number of intact ones in two minutes, is the winner. Those that fall on the ground or break, are not to be counted in the final tally. Divide the people into pairs of two, have them stand one step away from each other, and as soon as you signal, they have to toss a water balloon back and forth. 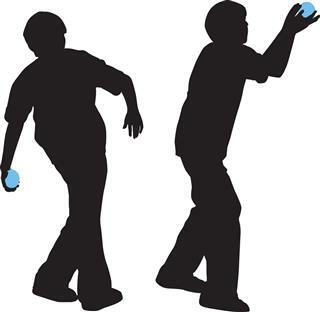 When you signal the second time, the players have to take a step back, away from each other, and continue tossing. If the balloon breaks or falls, the pair is out of the game. Likewise the game continues, with the players moving further away from each other, whenever you signal. The pair which remains till the end, with their balloon intact, is the winner! This is one of the most fun water games for adults. Divide the adults into two teams with equal number of participants in each, and assign a team leader. Give each of the participants eye goggles to wear. Next, make one of the teams stand in a circle, while the other team stands out. The participants of the team standing in a circle have one water balloon each. As soon as the whistle goes, one member of the team standing out comes inside the circle. The team standing in a circle, has to try to hit this other team's member with balloons. So, the team leader starts the game, while the other team's member has to dodge and avoid being hit. If the team leader misses the aim, the one standing next to him gives it a try. Likewise, the game continues in quick succession. Once the person is hit, the next one in his team enters the circle. 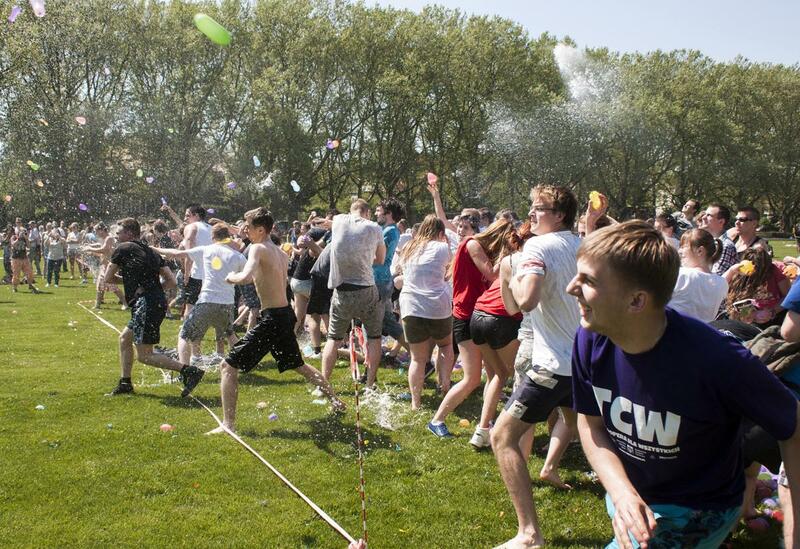 The game goes on till the team runs out of water balloons. The team which is able to hit maximum number of other team's participants is the winner of this outdoor team game for adults. Have all the invitees to the party stand in a circle. Next, give one of them a water balloon, and ask them to throw at anyone in the circle. The other person has to catch the balloon. After catching, he has to immediately throw the balloon at some other person in the circle. Likewise, it is thrown and caught, till it falls on the ground, and breaks. At this point, the one in whose hands it breaks, has to sing a song. Only then, he will be given a new one to continue the game. Continue with this game at the party, as long as it is fun. Afterwards, as a clean-up activity, give each of the participants a bucket, and say that whosoever collects the maximum number of balloon pieces wins a prize. With this, you won't have to worry about keeping the party venue clean. Aren't these games simply irresistible? Plan them with a group of adults, the next time you have a get-together, and see them getting all charged up, cheery, and uncontrollable like kids.